The Original Gorillapod is the lightest and most versatile camera tripod available today. Featuring over two dozen flexible leg joints that bend and rotate, the Gorillapod will firmly secure your compact digital camera to virtually any surface — anywhere and everywhere! The Gorillapod is the ideal camera accessory for photographers on the go. Throw it in your pocket or backpack and you'll be ready for your next adventure! While the Gorillapod serves all the functions of a traditional camera tripod – steadying your camera under low-light conditions, taking timed group shots, etc. – it is the only tripod malleable enough to provide you with the perfect shot while wrapped around a tree branch, hanging from a pole, or perched on a jagged rock. The possibilities are endless! Dimensions: 15 x 3 x 3 cm, weighs just 45.3 grams. 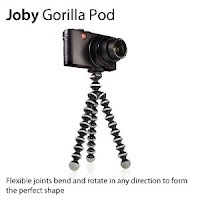 I bought the Joby Gorillapod for my husband for Christmas; he was thrilled and had never seen one before. It is an amazing 'bit of kit' and so flexible you can more or less attach it to anything. We've had hours of fun taking pictures of all the family; normally one of us gets left out, but now we can all be together in more family shots. This is bound to become a design icon of the future and really "does what it says on the tin". And a real bonus is that it's small enough to put in you coat pocket and weighs about 2oz. Just fantastic, highly recommended.